We found this lovely 63% silk/37% wool blend fabric and we are having it made into hand hemmed scarves sewn with silk thread. 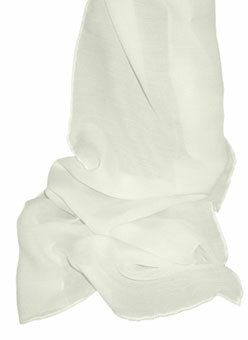 12.5mm makes it about the same weight as the 12mm Crepe de Chine and, with its diagonal weave, it drapes great as well! These can be dyed or painted with any product made for silk, like our Acid dyes below. They are warmer for winter than just plain silk, and quite soft for those who are normally irritated by itchy wool. A lot of men are wearing scarves now too, and the 11x60 or 14x72 sizes are perfect for them. With a bit looser weave and a wool blend like this, we recommend hand washing and line drying to cut down on shrinkage. A nice winter scarf and a good scarf for men. The fabric has a nice feel and dyes beautifully. Do NOT accidentally put one of these through the dryer because they will shrink significantly if you do.The 36x80 size makes a nice throw for a couch - good stuff!REALLY wish this scarf was available in like a 11x90 or longer. The way folks are wearing their scarves really require a longer narrow scarf and it not being available is a bummer. 37 of 37 users found this review helpful. I am delighted with these scarves I am dyeing using plants with eco printing and the results are amazing.I will be ordering more of these and the fabric also. 26 of 26 users found this review helpful. Really nice scarf nice weight nice drape lovely feel wonderful to have a "wintertime" scarf. Just be forewarned that the 14 x 72 scarves shrink a full foot in length to 14 x 60. That is with a cool water wash with very delicate agitation and line dry. I tried several and they all did the same shrinkage. The 8 x 60 scarves shrank to 52 length with same washdry process. When I wrote to Dharma they just said 'try less agitation'. Not possible if you're going to prepare these for ecoprinting with steam. I will try buying yardage and making my own in order to end up with a 72" long scarf. 44 of 47 users found this review helpful. Lovely the combination of silk and wool makes such an elegant scarf with my wool coat. I dyed a few of these but was disappointed to see that the shiny hem thread did not dye. The 5 stars are for the excellent Dharma customer service they gave me a full refund even for the ones that were dyed. Dharma has the best customer service of any company I've ever dealt with plus the staff is extremely knowledgeable about dyes and fabrics. Shrinks about 10% in length with gentle handling. I hand-painted a couple of 11x60" silkwool scarves for a charity auction and they were snapped up immediately and brought high prices and happy customers. I waited patiently for the 36x80" to come back in stock and I love love love the one I hand-painted for myself. My office is freezing with the AC and this is just enough to be comfortable and not weighed down. I didn't agitate it at any point in the process and the final blocked length is 76". I've ordered more! I would love this in an Infinity Scarf especially if it were extra wide so it could be a wrap. Some of these were also hemmed with poly thread. Products inconsistent. These scarves are beautiful. I expected them to be itchy (I have sensitive skin) but they have just enough silk to offset that. They drape very nicely too. I found these very hard to dye. Very disappointing I really wanted a good option for men.